Don't forget blog, tweet, or add photos to our flickr group about your experience at bloggerprom. And of course, leaving comments here (and your blogpost URL if you wrote up about it already); here's to a bigger and better event next year! Last words to live by, attendees -- we will be closing the check-in at 9 p.m. so we can start checking folks out (w the bling-bastic goody bags) at that time. Over and out and see you there! Yep, we've partnered with a few additional food sponsors who will be providing some more treats so be sure to save some room in your tummy! 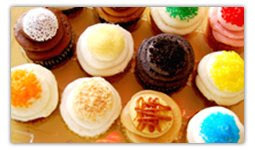 Polkatots will be providing an assortment of tasty, finger-friendly mini-cupcakes. 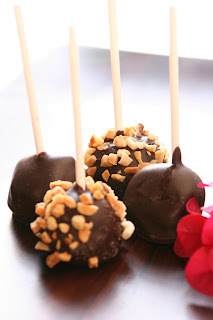 And then there are mini-cheesecake pops from Pure Cheesecakes, no utensils needed! Finally, Barrie Lynn (a.k.a. 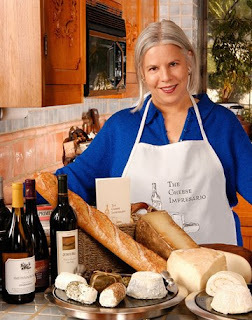 the Cheese Impresario) will bring an assortment of cheeses with her -- she'll even pair the cheese to whatever you're drinking; just let her have a sip of your beverage through a straw and *BAM* perfectly-matched cheese to nibble on! This has been a bloggerprom public announcement, you may now commence with your day's activities (namely, preparing for tonight). See you there! So for this prom we stayed away from streamers, hanging banners and "Fish Under the Sea" themes opting for a classier route because, really, the prom attendees' costumes will basically steal the show anyway, right? 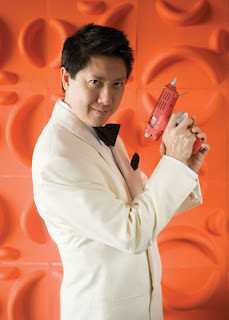 In any case we were sooo lucky to land design/lifestyle expert, master of the glue gun and author of Walls that Wow, Flowers that Wow and Parties that Wow, Jonathan Fong, to do the floral decorations for our lil ol' prom. Wow, indeed. Jonathan has also been profiled in the likes of Life, Angeleno and Los Angeles Times Sunday Magazine to name but a few, and has been featured on Fox News and "Good Day L.A."
I had met Jonathan at an underground dinner (he had created the beautiful table centerpieces there) and I mentioned the prom to him and instantly I saw the sparkle in his eyes. He was excited to be a part of such an unusual event. "I'm trying to decide between something fun or something elegant. Is there anything on my Web site that you liked?" he asked. "How about something fun with '80s colors (pastels or neons)? Everyone will be dressed in ridiculous prom attire if that gives you any ideas," I replied. Maybe we've been bragging about our awesome, Prom-themed signature cocktails a tad too much. (Nah.) But now it's time to give you the scoop on our fabulous Blogger Prom menu by RH's own Sebastian Acharmbault. It's a menu designed to be fun yet savory enough to keep you satisfied throughout the night. The following is just a peek of the night's menu to come. After all, we wouldn't invite so many foodie bloggers without making sure we could live up to the task! Also on the Andaz rooftop where you are able to serve yourselves will be a cheese station featuring selected Cowgirl Creamery cheese - also, a charcuterie station. Not only that, but there will be a station featuring ceviche and marinated salmon. Yum!! It's possible. 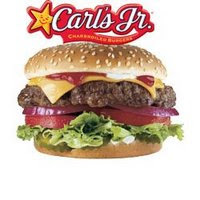 You will more than likely leave the Prom full - all without ever having to select "chicken, veggie or steak." But that's not it. After the prom at 10 PM, RH is welcoming all attendees to their restaurant on the 1st floor for the Official Blogger Prom Afterparty. Also, when you order a cocktail during the after-party, you will get a complimentary serving of chocolate and hazelnut-encrusted frozen bananas. No, I've never tried one but I do hear they are heavenly. 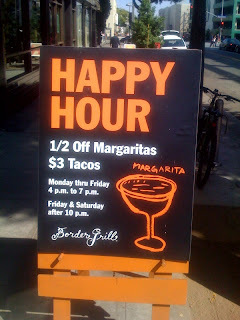 So whether it's liquid libations or delectable eats, we got your palate covered. It ain't a prom without a king and queen! Vote for your favorite bloggers to hold the coveted titles. The winners will rule over the land...well, just the prom at the Andaz West Hollywood, but still! They get fancy tiaras and congratulatory back pats. Just choose from the list of blogger attendees here, or if you meet any blogger tonight that you think is really deserving of a crown, send a tweet to @blogger_prom with the hashtag #promking or #promqueen. Deadline is tonight at 9pm and we'll tally up the votes with plenty of time for them to enjoy a celebratory walk around the ballroom. We already blogged about Verizon Wireless providing MiFi access to all us bloggers during the prom, but now they are also giving away a MiFi device and a $150 gift card as well--over $400 in value! Between 6 p.m. to midnight on Wednesday night tweet to them with your favorite feature of the VZW MiFi, which will be on hand to check out. Don't forget to use the #bloggerprom hash tag too! Then, post-prom, a winner will be selected at random and contacted via direct message within 48 hours for their contact information. If they do not respond within 48 hours, another winner will be chosen. Good luck and remember to tweet away! Of course it can't be a cheesy prom without some radical cheesy music, and we were lucky enough to get a dj to man that very important responsibility: DJ WMDeez, as in "Weapons of Mass Destruction." At the prom, since the joint will have free wifi courtesy of Verizon Wireless, attendees are encouraged to Tweet their song requests to @blogger_prom during the event. DJ WMDeez will try to honor most requests but the event is only three hours long so don't be too sad if your song doesn't get played. There will be a bunch of dance hits and nostalgic tunes to please everyone and keep the dancefloor busy. 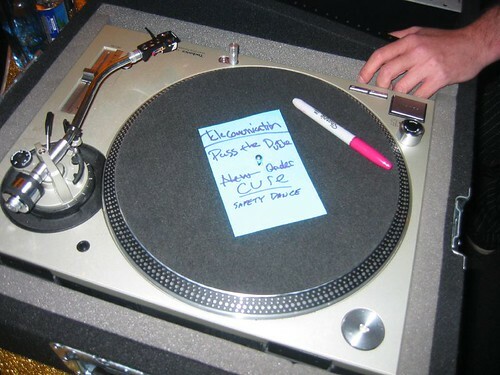 Now a few words from your DJ. "As Wednesday night approaches, I know everyone is getting more and more excited for the event. As your DJ I'm here to tell you that there will be no lack of musical magic happening with a great mix of classic songs from one of the best prom song decades of all time: the 1980s. As for me, I couldn't be more excited to be involved. "I cut my teeth mixing songs in sweaty, grungy basement parties in college and have been pursuing gigs to expand my musical horizons ever since. Having moved to LA a year ago from the East Coast I've fallen in love with the culture of music and art here. "My passion for DJing has grown even more which is why I'm excited to bring you a mix of heartbreakers, love-makers, and booty-shakers this Wednesday night. "Requests are encouraged at all times via our Twitter account @blogger_prom so please don't hesitate to take advantage of it! I typically 'spin' a mix of electronica and dance with classic and new top 40 hits sprinkled on top so Wednesday is going to be a real treat for me. I write music and work on remixes when I'm not punching the clock at day jobs and can't wait to get out to more DJing gigs around the city." As this is a bloggers-only event, only bloggers are attending. So we thought it would be cool to show just who is going to be part of this oh-so-special liquor-infused prom. These are just some of the many cool peeps. If you're not listed below, please add your info in the comments and we'll update the post. FYI, this isn't the master check-in list outside of the blogger prom committee. That's going to be printed off Pingg so, and this is very important, please make sure to add your full name and that of your guest's to the Pingg rsvp (this won't be publicized). Now we can't express how much we want you blogger prom attendees to take this "prom" theme seriously. We want you to go all out with your outfit. We want you to bedazzle, we want you to accessorize, we want you to shock and awe. We want you to wear something that you would never wear anywhere else. If you don't show up en costume, sorry, but you're not getting in. That's right, we're going to be hard asses and say that just because you're on the rsvp list doesn't guarantee you entry. If you're not dressed up in cheesy prom attire (not necessarily '80s, cheesiness of any era will do), we're not letting you in. And we can enforce it, too. Check-in for the prom will be in the Andaz lobby. Once you get past us, you will be allowed in the elevator and taken to the penthouse where the ballroom and event are. There will be a bouncer and two blogger prom committee members who take this event seriously and who will check people off. And no amount of begging, bribing or bullying is going to get you in if you're a plain Joe or Jane. Everyone else will have made an effort so why shouldn't you? Once you're in, you'll get to partake of all the cocktails, wine, beer and Andaz's fabulous food. There will be professional photographer, Claire Barrett, to capture your promness. You may even get a chance to win one of the many fab raffle prizes and who can forget your guaranteed bag o' goodies? Dressing up is a teeny-tiny entrance fee to pay. And we want our guests to not be afraid of rocking the cheese, be it hoop skirts, powder blue tuxes, mullets, acid wash jeans, neon tutus, Gunne Sax bridesmaid gowns, etc. So if you were worried, "I don't want to be the only one wearing Prince's purple velvet suit!" Don't be. You are not alone and we'll make sure of that. If you haven't gotten your outfit yet, check this post for some ideas on where to shop. There's still time to shop this weekend! 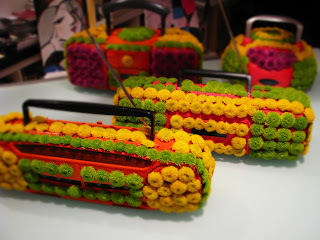 Oh, goody - everyone wins with bloggerprom goodie bags! We've blogged about what to wear and the music that will be playing, but let's talk about the real fun stuff, the free goodies! Besides the free booze, cocktails and eats from the sponsors featured on our left side bar and giveaway items to be raffled off at the party, everyone at Blogger Prom will be going home with their very own gift bag. Hungry Card Decks Los Angeles 2009: $10 off select restaurants. 52 ways to try something new. A Free Taco card for the new Border Grill Truck. A box of Extinguisher Candy a bold flavored candy that puts you in control of an intense sour experience! Eat the tangy, sour and super sour candies, followed by the blue Berry Sweet Relief candy to “put out” the sour – then start all over again! 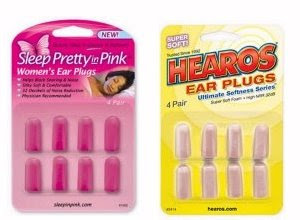 Sleep Pretty in Pink (not to be confused with the Molly Ringwald flilm) and Hearos earplugs from DAP World. Perfect for blocking out a snoring partner, harping boss or for your next concert. 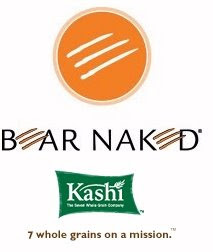 Bear Naked & Kashi items - to get your morning started right the day after! Hair Polish & Volcanic Ash Root Amplifier from David Babaii for Wildaid. Each retails for $9.99 and can be purchased at Sally Beauty Supply, Rite Aid or on their website. A 120z glass bottle of the new Pepsi Natural, a premium cola made with all-natural ingredients, including natural sugar, natural caramel, kola nut extract, natural apple extract, and lightly sparking water. 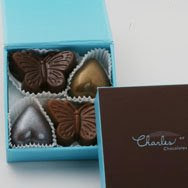 A four-piece gift box from Charles Chocolates, including one tea ganache, one pecan fleur de sel caramel, one peanut butterfly and one heart ganache. 30% off discount coupons for Live! on Sunset. 10 ½ oz. packages of Sun Chips where the bags are made with 33% renewable materials. The really exciting news is that in 2010 though, Sun Chips plans to introduce the first fully 100% compostable chip bag. Check out this video about it, pretty cool. Warner Bros' DVDs The Big Bang Theory! or Terminator Sarah Connor Chronicles or Pushing Daises. And who knows there might be some more last minute suprises too! Wow, did time fly by that quickly? 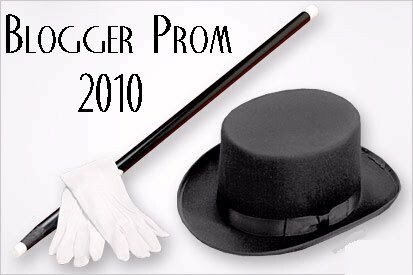 BloggerProm is less than seven days away! If I had two extra fingers I can count them on one hand. Anyways, see below for the e-vites with the basic event info (click to enlarge) of course, keep an eye on this blog for additional details, last-minute updates and other juicy gossip. Needless to say, much thanks to all our sponsors for making this happen! And one final note for RSVPs: if for some far-fetched, outlandish reason you or your plus one cannot make the event after your replied 'yes' or 'maybe' to our Pingg e-vite site, please change your RSVP so that we can bump up the bloggers-in-waiting on our waitlist. Thanks! HAY GUYZ, there's a spot! Being Angelenos of some experience ourselves, the committee's got your back when it comes to finding parking for the bloggerprom at the Sunset Strip. 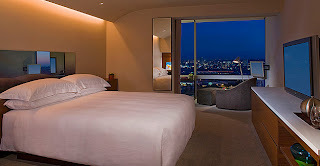 Thanks to our partnership with the Andaz (which also hooked us up with some nice room deals too), they are offering $7 valet, w validation, for bloggerprom attendees! Pretty sweet, considering their regular rate is up to $26 and one can easily use up just as much in gas and rates looking for spaces on the street or at other lots on the Strip. 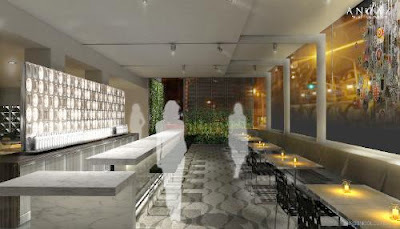 However, discounted spots at the Andaz are limited (100) so do carpool with your +1 if possible. 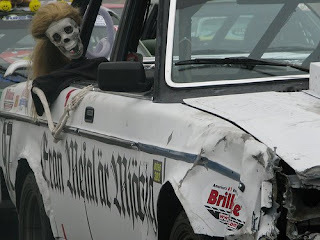 Or better yet, do it in the true cool prom fashion and squeeze in as many peeps as legally possible in those hot rides! Just like those days when everyone didn't have a car and a license. We look forward to seeing you there minus the blood, sweat 'n tears of space-stalking. Looking back at old yearbooks, it's fascinating to see who was chosen “Most likely to succeed,” “Class Clown” or “Prom King & Queen." 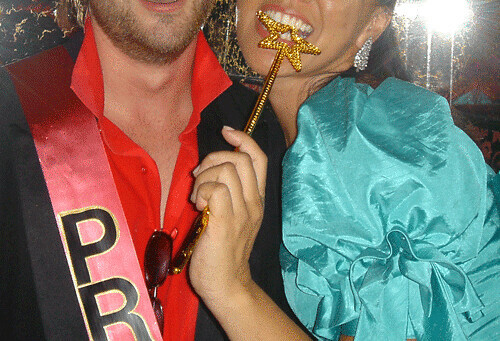 But now we, the Blogger Prom Committee, have editorial control of the superlatives that describe us this time around. Least Likely To Root for the Red Sox - Tara, who was formerly voted "Class Preppy" and "Best Smile" back in her yearbook days. Most Likely To Close the Blogger Prom Bar - YOU?! We'll have to see come July 22nd. What superlative would you like to have describe you now-a-days post school and post floppy disks? We of the bloggerprom committee do love us a good drink and we don't discriminate, so to round off the fantastic cocktails that Natalie have created for the event, we've teamed up with other sponsors to provide us some tasty wines and beers too for those preferring grapes and suds. First, we have the 2007 Boro Hills Sauvignon Blanc. According to the notes provided by Fresh & Easy, this is made from grapes in the Marlborough region of New Zealand, the grapes are primarily cool fermented in stainless steel tanks (with a fraction barrel fermented and aged for 3 months). The final product has aromas of "elegant gooseberry" and "ripe, tropical" fruits, with a "nicely balanced acidity on the long finish" not to mention striking a nice middle-ground between minerality and fruit. 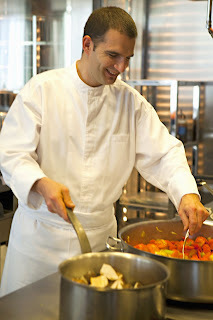 Best served chilled, either as an apertif or to pair with lighter dishes such as salads and seafood dishes. For those preferring something more red 'n robust, Fresh & Easy is also supplying the award-winning 2008 Ambas Malbec from Mendoza, Argentina. Again, the grapes are primarily fermented in stainless steel to preserve fruit notes with a portion aged in oak for richness and complexity. The flavors and aromas are "rich and concentrated"; expect "bold, ripe blackberry" with a long, velvety, smooth finish. And, if it's anything like the 2007 version, it's a "stick to your ribs country-style breakfast" kind of wine. Best paired with steak or tomato-y dishes. 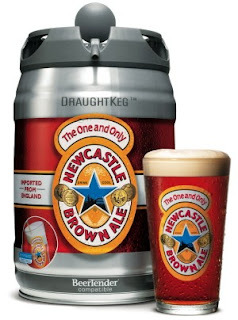 Finally, for the beer-inclined - we partnered with Newcastle just in time for the debut of their DraughtKeg (using the same technology as Heineken's), a pressurized, recyclable mini-keg with a internal CO2 mechanism that dispenses up to 10 pints of "fresh-from-the-tap" Newcastle Beer, And, in case you can't finish it all, the DraughtKeg keeps the beer fresh for up to 30 days! The best part? You can bring home the experience without a whole lot of wallet damage! 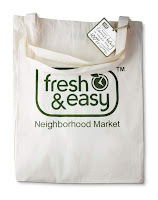 At Fresh & Easy, you can get these exclusive sauvignon blanc and malbec for $5.99 and $4.99, respectively; and the Newcastle DraughtKeg will be available at select Southern California locations for approx. $23. So no matter what glass you'll be holding (yes, even if it's a water goblet) there's something celebratory to cheers to! Your blogger prom committee has been working tirelessly at lining up all sorts of cool raffle prizes, goodie bag swag, an amazing venue, sumptuous nibbles and, of course, a buzz-worthy array of lascivious libations. In addition to the wonderful spirit and wine companies providing the liquid fuel for this celebration of So-Cal’s blogosphere, we have two specialty cocktails for you to enjoy. My cocktail blog, The Liquid Muse, is the backbone to my beverage consulting & mixology services. So, what better for this committee member to contribute to Blogger Prom Signature Cocktails! The Prom Punch Jungle Juice is, of course, designed especially for this event. Springboarding off the Jungle Juice of high school days (which was likely some variation on Everclear & Hawaiian Punch) this grown-up version is easy to make, tastes delicious and can be whipped up in big batches (should you decide to make it for your parties). Best of all, this recipe features natural juices and a quality spirit: Pinky Vodka. Touted “the most beautiful vodka in the world,” Pinky is kissed with rose and strawberry notes, making it extremely mixable and delightful chilled, straight up. The sugar rim and lollipop on this “tini” style Jungle Juice are whimsical garnishes because – hellooooo – Blogger Prom is all about the fun! The Flor de Maria is a slightly more serious drink for the discerning cocktail-lover. Its teeny bit more labor intensive and a recipe I’m rather proud to have created for the celebration of LA’s female mixologists at the Gran Centenario Roseangel tequila party at Malo, a few months ago. In addition to the hibiscus-infused Roseangel, this drink includes a homemade ‘hibiscus cabernet syrup,’ which I created especially for this drink. This cocktail takes the tequila lover beyond the margarita and into the world of creative mixology. I know I speak on behalf of the whole Blogger Prom committee when I say that we look forward to clinking glasses with you all! Rim a martini glass with colored sugar, set aside. Shake all ingredients with ice. Gently strain into rimmed martini glass. Garnish with a lollypop across the top of the glass. Muddle orange zest in the bottom of a cocktail glass. Add maraschino liqueur, syrup, lemon juice and tequila. Shake, with ice. Strain into a cocktail glass. Spritz with orange flower water. Garnish with a sliver of lemon zest. Blogger Prom is so awesome, we are getting our own cloud! No, not the smelly kind that wafted out when you opened the high school bathroom door or these ugly June Gloom ones up in the sky. We’re talking about an internet cloud! Verizon Wireless is decking up the Andaz roof for prom with several MiFi devices and HP Mini netbooks, so we can blog live, web tweet, upload photos, all that geeky stuff. If you haven’t played with it yet, the MiFi is the size of a thick credit card and delivers a personal Wi-Fi cloud for up to five users in a small area (Engadget article here) at one time. Plus, it’s a secure connection for anyone whose blogging may get a bit rough after several of Natali's cocktails. So, bring your own PDA, iTouch, whatever or borrow one of the netbooks that will be set up in our mock school computer lab, either way, you’ll be wired at the prom! Be careful of drinking and blogging though, opps too late. 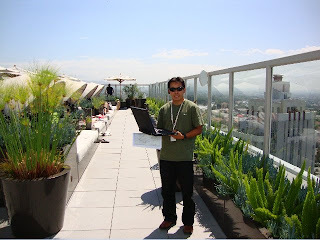 On the rooftop of The Andaz West Hollywood Hotel, Verizon Wireless engineer Peter Kheang tests the company's EVDO network, which will provide poolside internet access during Blogger Prom.